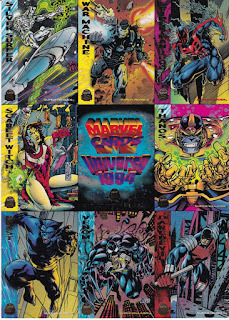 200 cards (including the checklist card), plus three chase card subsets: four card holograms, nine card "Power Blasts" and ten "Suspended Animation" cards featuring cel-like renditions of characters from Marvel's current animated series. 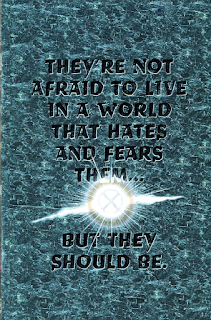 The front of the main hero/villain cards feature an image of the character, with a solid color border running top to bottom on the left hand side, with the character's name in the top left written in shiny foil lettering. 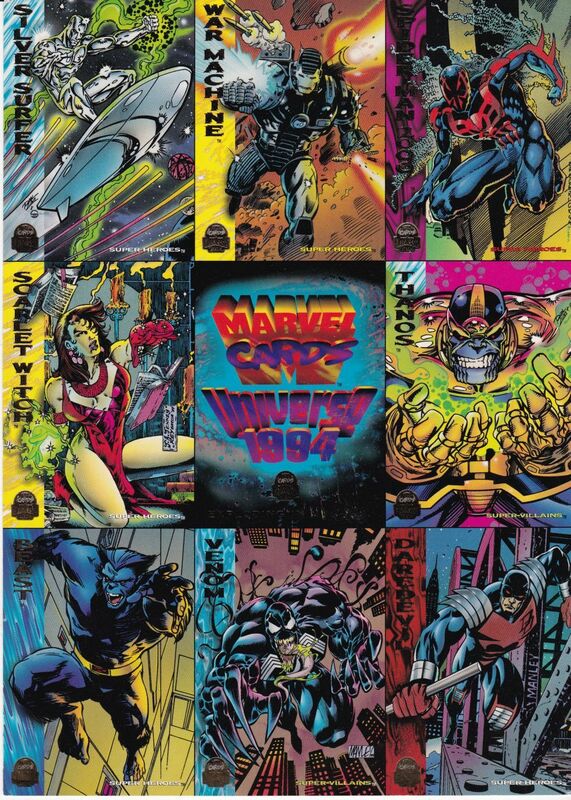 Like the Marvel Masterpieces and the recent Fleer Ultra X-Men sets, these cards are pretty on thicker stock, with a glossy finish. The hero/villain card backs are all landscape orientated, with a short bio above a power ratings graphic on the right (the power ratings *really* need an "energy projection" category, to balance out characters who may not be super-strong or great fighters, but still powerful). On the left, a “moment of truth” featuring a significant event from the character’s history (depicted via an original art recreation of the event) with the issue in which it occurred, above the character’s names and group affiliations. The card’s artist(s) is also listed on the back. No Power Rankings this month (since the last two months' of reviews have been Retro X-aminations or limited series/one-off things), but we should be back on schedule as of 9/5, with minimal interruptions (barring unforeseen complications) at least through the end of the year. And so we dive back in to regular goings, with more setup for Generation X, the conclusion of the Nimrod and Malice stories in X-Force & X-Factor, and the continuation of mild relevance for Excalibur, amongst others. 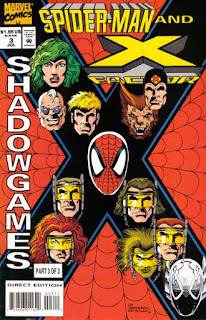 "Shadowgames" / "Shadowclash" / "Shadowfall"
Spder-Man & X-Factor take down a shadowy government project to artificially create superhumans. Issue #1: While attempting to attend a charity event hosted by Flash Thompson, Spider-Man is attacked by a group of superhumans called the Shadowforce. Due to the presence of Flash, Spider-Man is unable to fully defend himself, and his annoyance at Flash is mimicked by Shadowforce member Mirrorshade before Spider-Man is captured. Witnessing all this, Flash ultimately contacts X-Factor for help, telling them Spider-Man was kidnapped by mutants. Forge investigates and discovers most of the members of Shadowforce are supposedly in prison, while Spider-Man wakes up in Shadowforce's base. 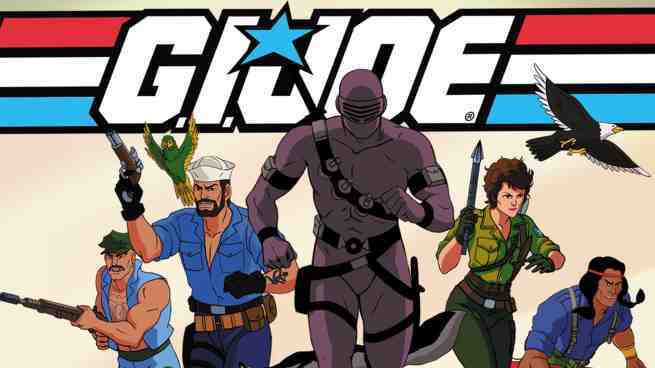 After escaping confinement, he learns the members of Shadowforce are the result of a secret military project attempting to recreate the powers of existing superheroes. He copies data about the project onto a disk, then notices Mirrorshade, intent on killing Flash, escape, but before he can follow him, X-Factor arrives, triggering a conflict with Shadowforce. "Wish You Were Here!" 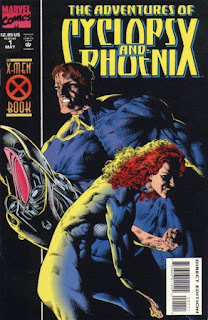 / "Tenure" / "Through the Years" / "Sacrifice"
Cyclops & Phoenix spend their honeymoon two thousand years in the future, raising Cable & preparing him to overthrow Apocalypse. Issue #1: In the midst of their honeymoon, Scott Summers & Jean Grey-Summers find their minds pulled two thousand years in the future and deposited in new bodies by Mother Askani, who turns out to be an elderly Rachel Summers. They arrive in the midst of an attack on the Askani stronghold by Apocalypse's forces, led by Ch'Vayre, in which they've captured the clone of Nathan Summers. Rachel explains that she needs Scott & Jean to help raise & protect Nathan, who is destined to destroy Apocalypse & liberate the world. Rachel manages to imbue Scott & Jean's new bodies with versions of their powers, an act which puts her in a coma. Together, they manage to rescue Nathan & escape Ch'Vayre along with Rachel's body, after which they set out to build their little family. Wolverine & Nick Fury battle a new Scorpio. A SHIELD camp in Peru is attacked, with everyone there, including David Nanjiwarra, killed by someone who leaves behind a Scorpio image. Receiving word of the attack, SHIELD head Nick Fury decides to investigate it personally due to his relationship with the original Scorpio. Meanwhile, Wolverine learns of Nanjiwarra's death, something SHIELD had hoped to keep from him, and decides to investigate his death himself, as Nanjiwarra was an old friend whom Wolverine suggested join SHIELD. When Scorpio attacks a SHIELD base in Venice, Fury is waiting, and though Scorpio escapes, Fury confirms its not his long-dead brother, the original Scorpio. 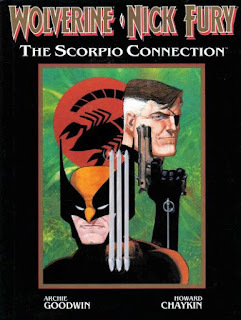 Meanwhile, Wolverine tracks Scorpio from Peru to Istanbul, where he encounters Scorpio's mother, Amber D'Alexis, and is nearly killed by Scorpio, who believes he is the son of Fury's brother. Wolverine is rescued by Fury, and the pair track Scorpio to a base on the Aegean Sea, where Amber has laid a trap for them. However, when Scorpio & Amber attack a SHIELD facility in Atlanta, Fury & Wolverine are waiting, having escaped Amber's trap. Scorpio & Amber flee attempt to flee, but Fury manages to disarm Scorpio, at which point Amber reveals he's actually Fury's son. Wolverine kills Amber, but Fury stops him from killing Scorpio when he reveals that Nanjiwarra was a traitor to SHIELD, sating Wolverine's fury about his death. Instead, Fury takes Scorpio into custody, hoping to deprogram him, and Wolverine bids Fury farewell, while also congratulating him on becoming a father. "And Introducing Karma! She Possess People!" / "Cry -- Vengeance!" Spider-Man is possessed by an unseen figure and made to attack a party hosted by General Coy. The Fantastic Four are in attendance, and defend Coy against Spider-Man. When Spider-Man gets the better of them, Coy's nephew Tran secretly intercedes, breaking Spider-Man's possession. The FF take him to the Baxter Building, where a scan reveals evidence of the possession. Mr. 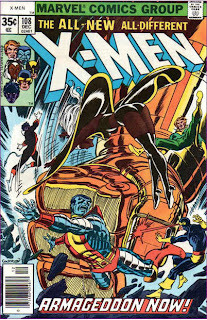 Fantastic contacts Professor X, who confirms the presence of a new mutant in the city. 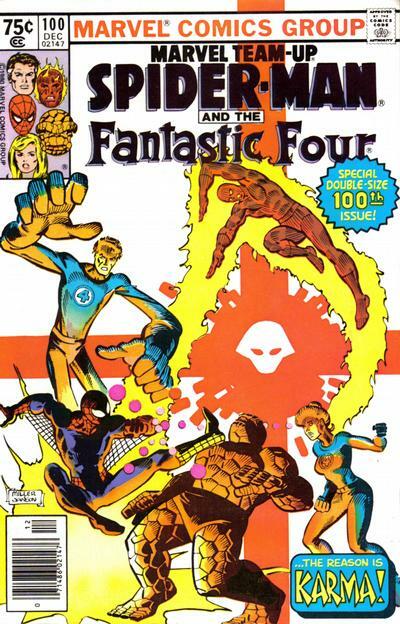 The FF & Spider-Man track the mutant to a church, where they encounter a young woman named Xi'an. She tells the heroes of her childhood in and flight from Vietnam, and how her criminal uncle General Coy and her twin brother Tran have taken her younger siblings hostage in order to force her to work for them. It was they whom she was attempting to rescue using Spider-Man (who she believed to be a criminal, thanks to news reports). 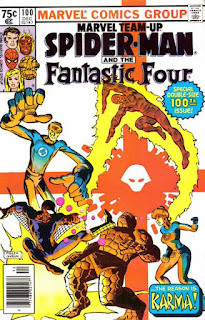 The FF & Spider-Man agree to help Xi'an, but when they attack Coy, Tran, who shares Xi'an's mutant ability, takes control of the Fantastic Four and pits them against Spider-Man. This forces Xi'an to use her power to counter her brother's, ultimately killing him. 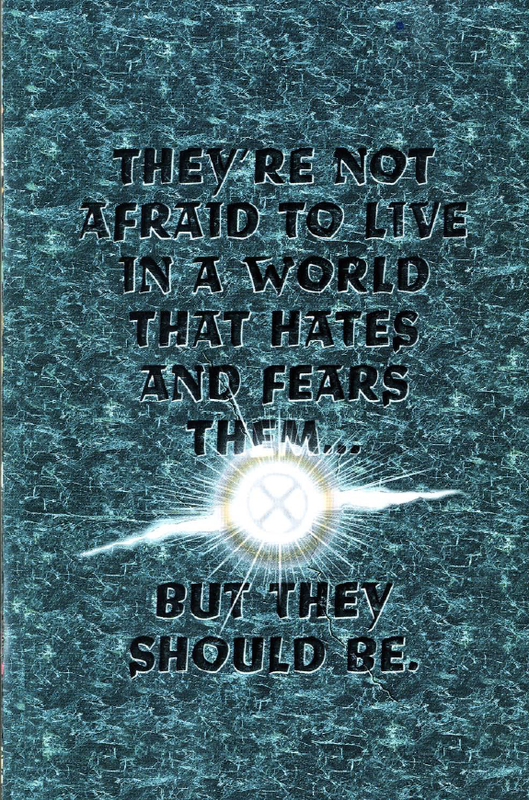 Accepting she shares some her brother's darkness, Xi'an christens herself Karma and is reunited with her siblings, as the FF & Spider-Man marvel at her power.